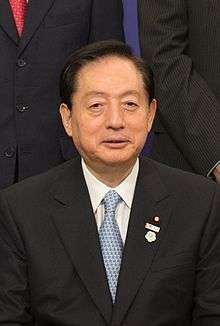 Under Japan's constitution, this result virtually assured DPJ leader Yukio Hatoyama would be the next Prime Minister of Japan. He was formally named to the post on September 16, 2009. 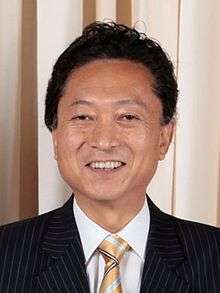 Prime Minister Taro Aso conceded late on the night of August 30, 2009 that the LDP had lost control of the government, and announced his resignation as party president. A leadership election was held on September 28, 2009. 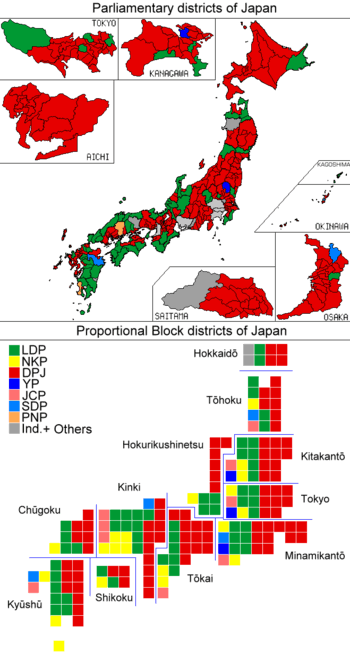 The last general election took place in 2005 in which the LDP, led by popular prime minister Junichiro Koizumi, received 38.2% of the proportional block votes and 47.8% of the district votes cast (the next largest party, the DPJ, received 31% in the proportional and 36.4% in the district vote). Due to the characteristics of the Japanese election system, the LDP ended up with 296 seats in the Lower House (61.6%), which enabled Koizumi to complete the privatization of Japan Post. Since then Japan has had three further prime ministers (Shinzō Abe, Yasuo Fukuda and Taro Aso) who have come to power without there being a general election. 1 2 "'Major win' for Japan opposition". BBC News. 2009-08-30. Retrieved 2009-08-31. ↑ "衆院党派別得票数・率（比例代表）". (in Japanese) Jiji. 2009-08-31. ↑ "衆院党派別得票数・率（選挙区）". (in Japanese) Jiji. 2009-08-31. 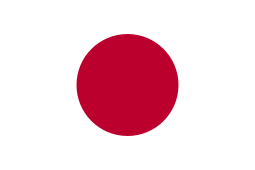 ↑ "Japan's election: The vote that changed Japan". The Economist. 2009-09-03. ↑ From Kyung Lah (2009-08-31). "Japanese opposition set for victory; PM quits as party head". CNN. Retrieved 2009-08-31. ↑ Stockwin, J.A.A. (2011). The rationale for coalition governments In Alisa Gaunder (Ed.) Routledge Handbook of Japanese Politics, Taylor & Francis, p. 36–47. ↑ Fackler, Martin (2008-09-22). "Japanese Party Chooses Aso as Leader". The New York Times. Retrieved 2010-05-05. ↑ Ryall, Julian (2008-09-18). "Japanese election brought forward". The Daily Telegraph. London. Retrieved 2010-05-05. ↑ Fackler, Martin (2009-02-20). "Japan's governing party faces political extinction". New York Times. Retrieved 2009-05-11. ↑ english@peopledaily.com.cn (2009-06-27). "Report: Japan's PM eyes general election in early August – People's Daily Online". English.people.com.cn. Retrieved 2009-08-31. ↑ "Japan PM 'calls August election'". BBC World News. 2009-07-13. Retrieved 2009-07-13. ↑ Buerk, Roland (2009-07-16). "Party rebels move on Japanese PM". BBC news website. ↑ "Japanese Parliament Is Dissolved". Reuters. 2009-07-21. Retrieved 2009-07-21. 1 2 "Railing against the wrong enemy". The Economist. 2009-08-20. ↑ english@peopledaily.com.cn. "Japan's former minister to launch party to campaign in election". English.people.com.cn. Retrieved 2009-08-31. ↑ Ryall, Julian (2009-08-27). "Japan election: unemployed turn on the government". London: The Daily Telegraph. Retrieved 2010-05-05. ↑ Hiroko Tabuchi (2009-08-03). "Opposition Woos Japan's Voters With Costly Vows". New York Times. ↑ Fujioka, Chisa (2009-08-21). "Japan opposition may score landslide win: media". Reuters. ↑ Fackler, Martin (2009-08-29). "Lost in Japan's Election Season: The Economy". The New York Times. Retrieved 2010-05-05. ↑ "J-CASTニュース : 未だに「視界不良」麻生政権 党内に不穏な動き". J-cast.com. 2009-07-13. Retrieved 2009-08-31. 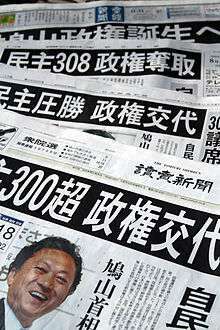 ↑ "Analysis: DPJ on pace to win 300 seats". Asahi Shimbun. 2009-09-20. ↑ "Survey: DPJ poised to win over 300 seats". Yomiuri Shimbun. 2009-09-21. ↑ 民主、圧勝の勢い　300議席超が当選圏　衆院選情勢調査 (in Japanese). Nikkei Shimbun. 2009-08-21. ↑ "DPJ could win over 320 seats in Lower House race: Mainichi poll". Mainichi Shimbun. 2009-08-22. ↑ 揺らぐ自民の牙城 15道県全敗か (in Japanese). Mainichi Shimbun. 2009-08-22. ↑ "DPJ Leader Hatoyama Says Domestic Demand Priority". Bloomberg. 2009-08-22. ↑ Seats for proportional representation are only for party rolls. ↑ A full House has 480 seats, so two were vacant at the time of dissolution. ↑ "Hatoyama says DPJ will form coalition even if party performs well in election". Mainichi. 2009-08-22. ↑ General election results final breakdown. Kyodo News. August 31, 2009. ↑ Psephos - Adam Carr. August 31, 2009. ↑ Nihon Keizai Shimbun. August 31, 2009.